Pizza, pasta sauce, and more of our favorite dishes just wouldn't be the same without oregano. Fresh or dried, this fragrant herb is used in kitchens around the world. In addition to adding flavor to foods, oregano is rich in essential oils that give it a wide range of health-promoting properties. There are more than 40 varieties of oregano, but the most beneficial variety is wild oregano (Origanum vulgare) native to the Mediterranean region. The essential oil derived from wild oregano is rich in phenols, natural compounds with antioxidant effects. The two major phenols in oregano oil are thymol and carvacrol. Oregano oil contains a variety of additional antioxidants as well as vitamins A, C, and E and the minerals calcium, magnesium, zinc, iron, potassium, manganese, and copper. Due to its antimicrobial, antibacterial, antiviral, and antifungal properties, wild oregano oil has a variety of uses. It improves respiratory capacity and is helpful for asthma, bronchitis, and coughs. Oregano oil's antibacterial properties make it effective for preventing and treating a variety of infections, including urinary tract infections, and it shows promise for preventing illnesses caused by pathogens like E. coli, salmonella, Staphylococcus aureus, and listeria. Oregano oil's antifungal compounds -- particularly carvacrol -- are found to be effective against five different types of Candida, the most common cause of yeast infections. High levels of Candida have also been associated with some gut conditions, such as ulcerative colitis and Crohn's disease. Diluted in a carrier oil like almond or jojoba (one part oregano to three parts carrier oil), wild oregano oil can be used topically for nail fungus, cold sores, and dandruff. It can also be rubbed into sore muscles to relieve aches and pains. 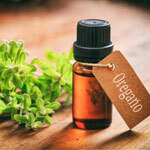 Wild oregano oil is available as bottled liquid oil and in capsules. The quality -- and therefore antioxidant capacity and potential health benefits -- varies among products, so be sure to select high-quality, unadulterated (Origanum vulgare). Oregano oil isn't recommended for infants or women who are pregnant or nursing, since it can encourage blood circulation to the uterus. And anyone allergic to plants in the mint family (mint, lavender, basil, and sage) should avoid oregano oil. Oregano is a staple in most kitchens, and this herb's essential oil is a worthy addition to your supplement regimen. Support wellness naturally with pure, wild oregano oil. © 2018 GeniusCentral Systems, Inc.